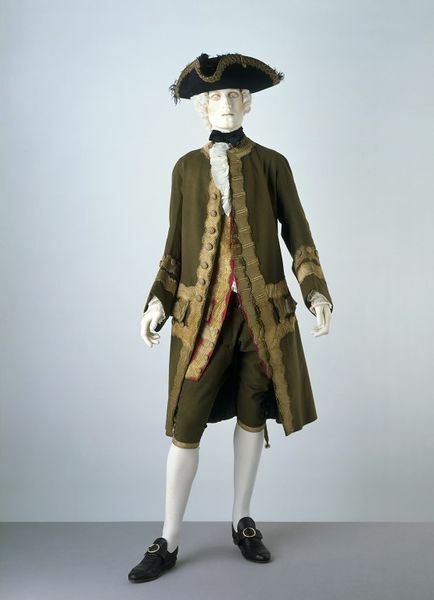 In the 18th century a man’s suit was not necessarily all made of the same fabrics. Sometimes the coat and waistcoat were of the same material, sometimes the coat and breeches, and sometimes all were made of different colours and fabrics. This ensemble from the 1740s was made to be worn together, but it consists of contrasting green and red wool. Both are trimmed with a wide braid of silver-gilt thread. Typical of the style of men’s dress of this period, the coat is collarless. It fits tightly to the body, but has very full skirts pleated to the sides at the hip. The sleeve cuffs are not quite as deep as they were in the 1730s. A man's coat, waistcoat and breeches of green woollen broadcloath and red woollen broadcloth. The coat is made of the green broadcloth and has a round neckline bound with a narrow strip of the wool. The sleeves are cut in two shaped pieces to fit loosely, reaching between the wrist and elbow with closed cuffs (18.5 cm deep at top, 22.0 cm at bottom). The body of the coat is cut to fit the torso to the hip, with skirts below, arranged in one pleat (19.5 cm deep) front and back of the side openings. There is an inverted pleat on either side of the centre back skirt opening. There is a scalloped pocket flap on each coat front at hip level. The coat is trimmed with 5.5 cm-wide woven lace of silver-gilt thread, around the neck, down each coat front, the pocket flaps and around them on the coat, the side opening of each front, each side of the back vent and two lines on each cuff. There are 9 silver-gilt passementerie buttons on the right front from neck to pocket with 9 corresponding buttonholes - all cut and bound with strips of leather wrapped in silver-gilt thread. Four buttons trim the coat fronts below the pocket flaps, the top row of woven lace on each cuff and the pleats at each side. The sleeves are lined with green linen twill, the coat body, cuffs and pocket flaps with green silk twill, and the pockets with bleached linen. The front edges are interlined, probably with buckram. The waistcoat is made of red woollen broadcloth, cut in 2 backs and 2 fronts. The fronts are longer, with skirts below the hip, 23 cm shorter than the coat. The round neckline is bound with a narrow strip of the wool. There is a pocket with scalloped flap on either side at hip level. The waistocat is trimmed with the same silver-gilt woven lace as the coat: the neckline of the fronts, the front edges and hems. There are 13 buttonholes on the left front, cut and bound with leather wrapped with silver-gilt thread. Three small silver-gilt passementerie buttons trim the waistcoat fronts below the pocket flaps. The waistcoat is lined with fustian above the hip; the skirts are lined and front edges faced,with red silk twill. 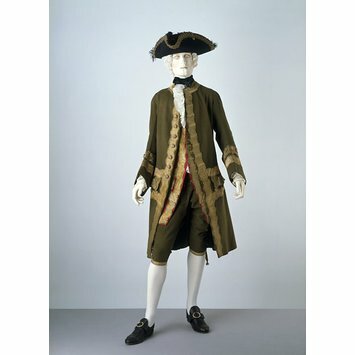 The breeches are made of green woollen broadcloth, the legs cut in 4 shaped pieces with the back legs gathered into the two-piece waistband. The waistband is lined with fustian, the legs unlined. There are 7 pockets, all lined with fustian: a watch pocket at the top of the right waistband, 1 in the waistband/front leg seam on each side, 1 in each front leg with a pockt flap on each side and 1 in each side seam with a buttoned flap. The breeches close with 3 large silver-gilt passementerie buttons and linen buttonholes on the waistbands and a small fall with 2 small passementerie buttons. The legs fasten with 5 small passementerie buttons on each outside back leg, corresponding with linen buttonholes on each outside front. There is a buckle ribbon of woven silver-gilt thread at the bottom of each leg. There are two bands, one with a buttonhole, on each side of the centre back opening of the waistband. The waistcoat and breeches were altered, probably for fancy dress in the late 19th century. The waistcoat front buttons were removed, and hooks and thread bars, then later eyes, added to the front edges. Four buttons were sewn to the front edge of the right skirt. A triangle of green flannel was sewn to the right side of the waistband at centre back, to fill in the gap.